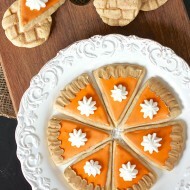 It’s officially fall! And if every other blogger hasn’t already alerted you to the fact that the seasons have changed, then I’m here to carry on the ever-lasting weather conversation here in the blogosphere. Welcome to the land of baked apples, cinnamon, nutmeg, and maybe even a little pumpkin. Okay definitely some pumpkin, and probably peppermint if you find an extremely over-achieving blogger on your feed. Some people have all their seasons and holidays baked out and photographed well in advance so when the occasion comes along, they have the appropriate posts all lined up and ready to go. 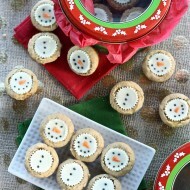 I tend to procrastinate a bit more and find myself baking last minute for these themed posts, but every once and awhile I’ll get the timing right. Even though bloggers have been posting apple recipes for weeks, I feel very appropriate timing today’s post with the second official day of fall – only one day late to the party is fine by me!! 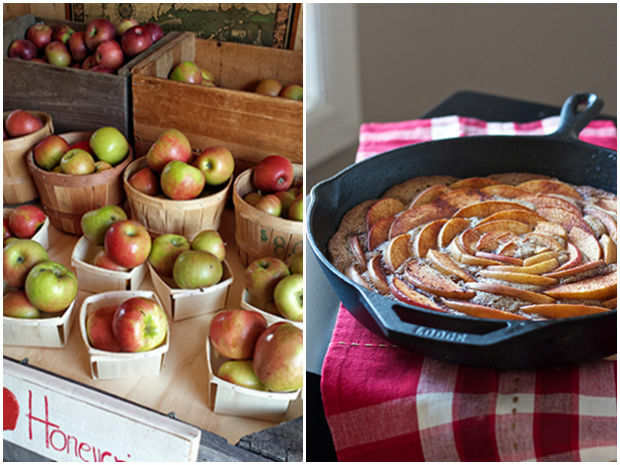 I visited an apple orchard this past weekend and picked some gorgeous Honeycrisp and Gala apples – two of my favorites! (Granny Smith is my true fave, but they weren’t available yet.) Apple picking is one of my most beloved autumn activities, and Ryan and I make a point to visit orchards at least once every year. It’s a bit harder now that we live in the city, but it’s worth the trip to the suburbs in my opinion! While we love New York and everything urban living has to offer, there are always things we miss about Connecticut. Malls, cheap grocery stores, golfing, and local orchards are definitely on the top of our list of most-missed suburban assets (plus my family of course!). So when Epicurian reached out to me to offer a state-shaped cutting board for myself and for a reader, I opted for a Connecticut state board instead of New York just because I love my home state for its beautiful fall weather and bountiful orchards. Gotta rep the ‘Cut and commemorate the great state with an apple-themed post and rustic cake to match. Which state shape will you choose if you win?? 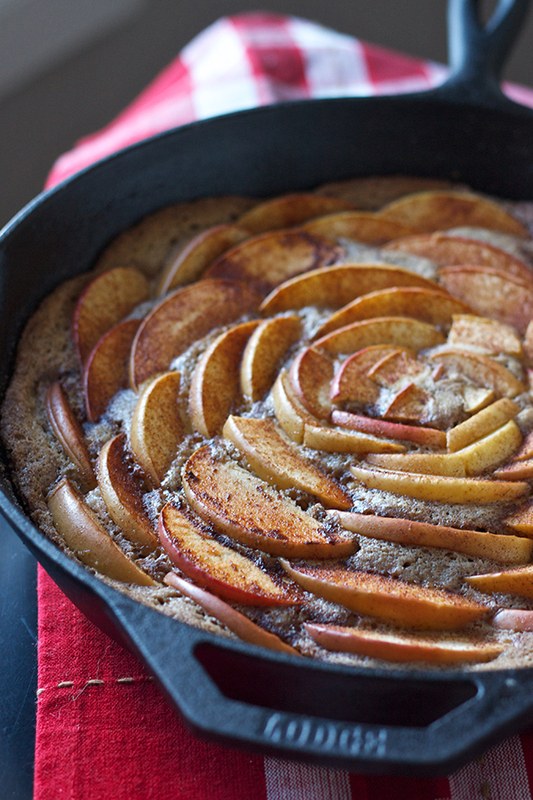 I knew I wanted to feature an apple post here this week alongside the giveaway since it’s the first week of fall, so I used my morning off yesterday to quickly throw together this skillet cake. 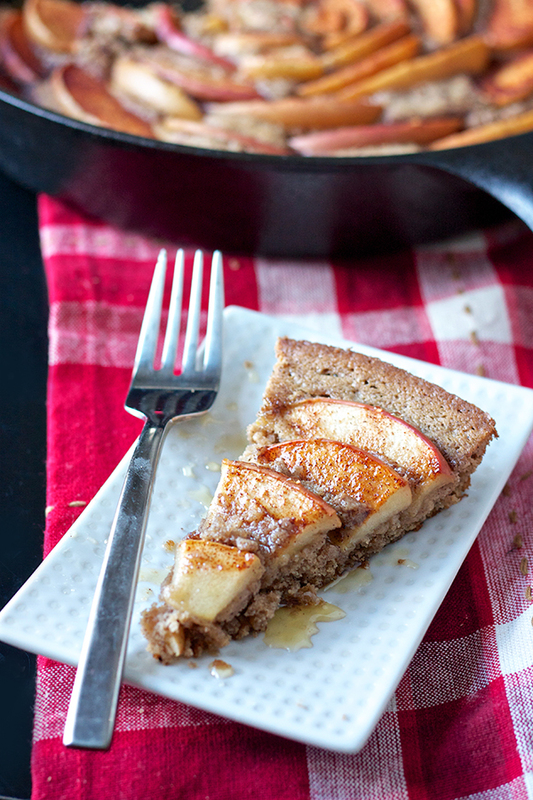 Nothing seems more rustic to me than a skillet cake, and more often than not rustic = easy. This cake is no exception – it was so, so simple to make but really impressive in presentation and taste. The fact that I picked the apples on Saturday and had this cake out of by oven by Monday morning is pretty cool in my opinion. The thousands of people who were just marching around my hood on Sunday for climate change awareness probably appreciate my support of local farming. And my support for really yummy cake! I’m usually not one to get excited about warm fruit, but since the apple is sliced so thin here, it doesn’t bother me as much and I love the pretty arrangement. I’ll sacrifice warm fruit for a pretty cake any day. This dessert would also be perfect for a Rosh Hashanah celebration this weekend – especially with a little honey drizzled on top like the slice below! If you’re loving apple season as much as I am and you’re looking for something to bake with them – try this cake! It’s definitely different than your standard apple pie, but it has the same flavors, just a cake for a base with no need to make a crust. 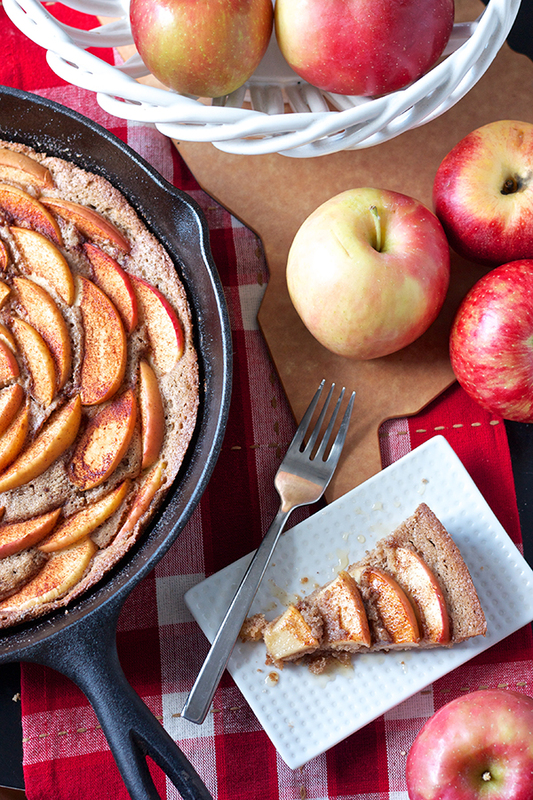 Baking it all in a cast iron skillet gives the cake some rustic elegance that fits right in with all things autumnal. And if you’re making this cake you’re going to have to cut a lot of apple slices, so you might as well enter to win a new cutting board to go with it, right?? Here are the giveaway details for winning your own state-shape Epicurian cutting board! Leave a comment on this post of what state you’d choose and make sure to leave a valid email address so I can message you if you win. Don’t worry, it won’t be made public! And here’s the recipe so you can run to your kitchen to make use of your fall fruit bounty. Good luck with the giveaway and happy apple season/fall/Rosh Hashanah!! Preheat oven to 400 degrees and grease a 9" cast iron skillet with butter or nonstick cooking spray. In the bowl of an electric mixer, beat together the butter and brown sugar for 2-3 minutes on medium-high speed, until light and fluffy. Add the egg and vanilla extract and continue to beat until smooth, stopping to scrape down the sides of the bowl as necessary. 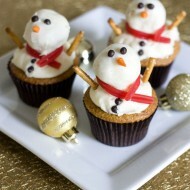 In a medium bowl, whisk together the flour, baking powder, baking soda, cinnamon, and salt. With the mixer on low speed, alternate adding the flour mixture and the buttermilk, starting and ending with the flour. Mix until just combined. Transfer batter into prepared pan and use an offset spatula to evenly distribute the batter. Cut apples into thin slices and arrange them on top of the batter in concentric, overlapping circles to resemble a flower. Keep adding apples until entire skillet is covered, then sprinkle with cinnamon sugar. Bake for 20 minutes, or until the edges are golden brown and a cake tester comes out clean. 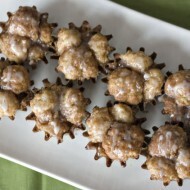 Serve warm and drizzle with honey if desired. I’m a Maryland girl and would love a cutting board in the shape of it. I”m living in a city now too and hope that I’ll be able to make it out for some apple picking some time this fall. I would love to have a Virginia shaped cutting board! Cajun born and raised so it’s going to have to be Louisiana. Wow on your cake! Pinned and will be made — soon! Looks beautiful! First…I LOVE skillet cakes! 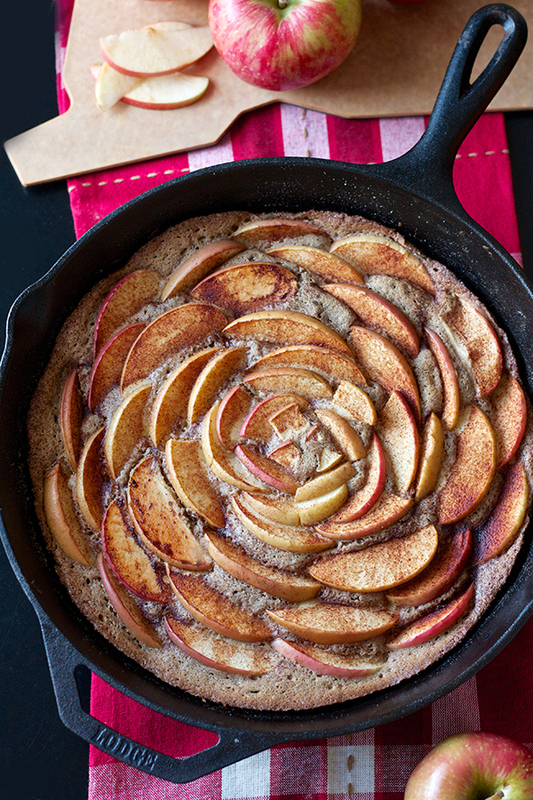 I have an apple picking adventure coming up this weekend and can’t wait to make this cake! While I am a Maryland girl like Liz, and do all the cooking in our house…my husband does almost all of the prep work. I would love to surprise him with a New Hampshire cutting board! I love cooking in my cast iron skillet so this recipe is perfect for me. Definitely a great cake recipe for the fall.. thanks for sharing it. Pinned! What a gorgeous photo! I made an apple galette last week and have been craving more apple-y cinnamon-y goodness, this looks like just the thing. I am excited to try it! Yum. This is one beautiful looking cake! I LOVE how this cake looks! We are heading to our local orchard this week, and I fully intend to make this. 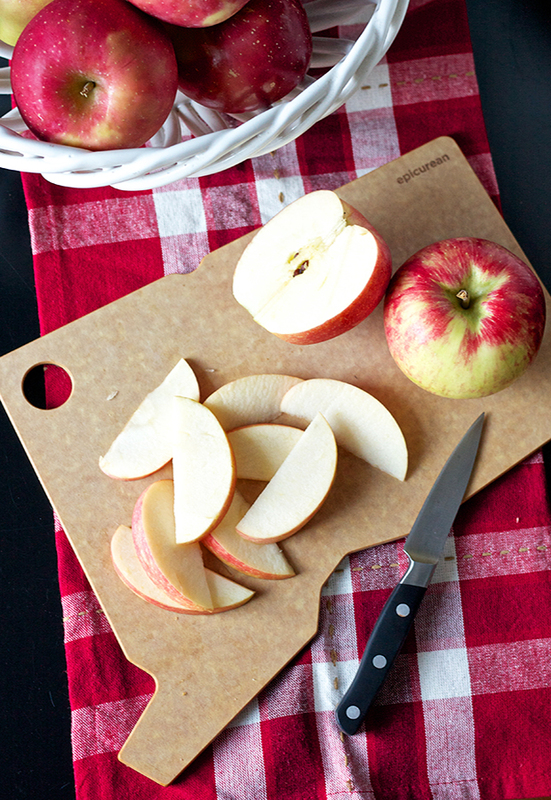 :) I’d love to win the super cute cutting board as well. Kansas for me! Yummy looking cake!! Hope it turns out ok without a cast iron skillet. I’ve lived in Florida for 20 yrs, but PA us where I grew up & learned to bake apple pies, so Pennsylvania is my state choice. 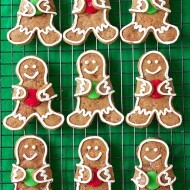 Now back to your blog for more good recipes!! Thanks for sharing. North Carolina! It will always be home and such a beautiful state in the fall! So pretty! Love the use of the skillet for cakes and brownies too. Pinned. I’ve lived in Massachusetts my whole life but I would choose a Wisconsin-shaped cutting board and give it to my mom! I would love to win one in the shape of California! Love your blog!!! Tried this out but it was disappointing. :( The cake rose a lot so it came out thick and bland. The apple topping was tasty though so I’m thinking this would have been much better with either 1/2 the amount of batter for a thinner cake or with more apples & spices in the cake itself. Hi Sue, I’m really sorry it didn’t turn out so well for you! I just checked out my cast iron skillet and I realized it’s a 10.5″ skillet, not 9″ so I was totally off! I always thought it was 9″. So that might be why mine looks thinner. Thanks for trying it out anyway. This looks amazing. 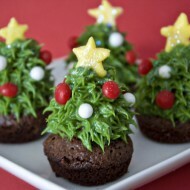 I am so going to make this for after dinner tonight. California would be my choice! Happy Fall! I would love an Arizona one! I’m going apple picking this weekend for the first time, maybe I’ll make this cake! Makes me want to go apple picking! Would love an ARIZONA cutting board. 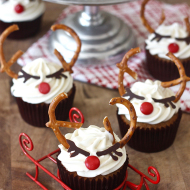 This cakes sounds perfect for our cabin trip next week. Would love a California one! Wow that cake looks beautiful! I would want a Hawaii cuttingboard, since that’s where I’m from: but I guess it’s hard to make all the islands connect, so Massachusetts would be my second choice (and probably more fitting, since it’s where I do all my apple picking). Love this cake! Going to try to make it soon. I love how it looks kind of like a rose. This sounds amazing, I’m making it tonight!! I’m a proud Texas Girl, so I would definitely pick a Texas-shaped board!! I would pick California, thanks! This is gorgeous Erica! Saw it on Pinterest. I love using my cast iron skillet. I do not have a sweet tooth, but do love to bake on occasion. I may adapt your recipe and make it GF, and add some almond flour for texture too. If I do, I’ll be sure to do the right thing and link back to you. Really, terrific post. Thanks! Would this work in a 9″ glass pie plate? Or I have a 12″ cast iron skillet. Or an 8″ round cake pan. 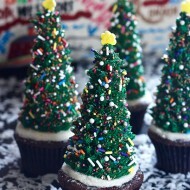 I really want to make this! I’m just not sure the best way to do it so I don’t have to buy another cast iron skillet! This cake looks so delicious. I can’t wait to try it! This was so delicious that my husband ate almost half of it in ten minutes! I loved how quick and easy it was to prepare and how beautiful it looked going into and coming out of the oven. Thanks for posting! Tried it again, it took my email address, but there is no place to enter…. There’s a button next to the space that says “GO” to enter your email address. I just added you! Love the looks of this dessert! Can it be made gluten free? Ps I would love a florida shaped board!!!!! I’m not sure how well-adapted the recipe would be for gluten-free, but I’m sure you could try just switching out the flour for a gluten-free variety. And sorry about the cutting board – the giveaway is already over! Hai can I substitute the buttermilk with anything else? Also can I bake this in a cake tin? You could use regular milk with a few squirts of lemon juice as a substitute. Or just regular milk if you’d like. And yes, can be made in a cake tin! When you’re doing the concentric circles do you begin in the middle of the skillet or at the outer edge? Thanks for the clarification. 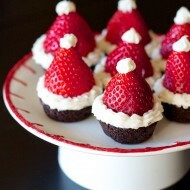 Looks like a yummy and beautiful dessert! Hi Erica! We LOVE this image and would like to feature it on our site. Please get in touch for more details – editorial.homemade@gravityroad.com. Thanks! Love it, and can’t wait to see what other recipes I can try of yours.